A first approach to the indigenous Orthodox Saints and Martyrs of the Ancient Church who lived and who propagated the Faith in the British Isles and Ireland during the first millennium of Christianity and prior to the Great Schism is being attempted in our website in our desire to inform our readers, who may not be aware of the history, the labours or the martyrdom of this host of Orthodox Saints of the original One, Holy, Catholic and Apostolic Church of our Lord. 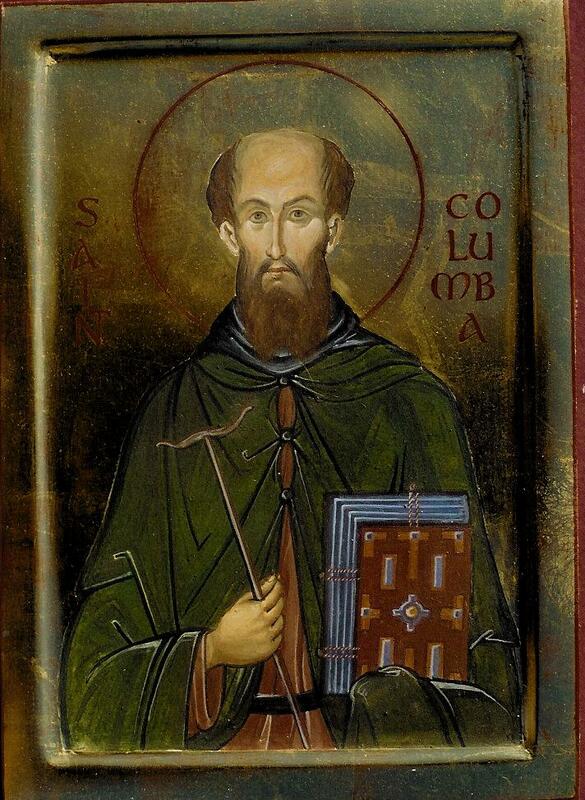 SAINT COLUMBA (also known as Columcille, meaning ‘Dove of the Church’) was born in Donegal on December 7, 521 to noble Irish parents. He became a monk and was soon ordained priest. Tradition asserts that, sometime around 560, he became involved a dispute over the right to copy an edition of the Psalter The dispute eventually led to the Battle of Cul Dremhe in 561, during which many men were killed. As a penance for these deaths, Columba was ordered to make the same number of new converts as had been killed in the battle. He was also ordered to leave Ireland and move such that he could not see his native country. He travelled to Scotland, where it is reputed he first landed at the southern tip of the Kintyre peninsula, near Southend. However, being still in sight of his native land he moved further north up the west coast of Scotland. In 563 he founded a monastery on the island of Iona off the west coast of Scotland which became the centre of his evangelising mission to Scotland. There are many stories of miracles which he performed during his mission to convert the Picts, the people who dwelt in Scotland in those days. In one story in his life, in 565 the saint came across a group of Picts who were burying a man killed by a monster that lived in the waters of Loch Ness, and brought the man back to life. In another version, he is said to have saved the man while he was being attacked, driving away the monster with the sign of the cross. The primary source on the life of St. Columba is the Life of St. Columba, a hagiography by St. Adamnan of Iona. St Columba is believed to be buried together with St Patrick and St Brigid of Kildare in Downpatrick in County Down, deep within the famous Hill of Down. His feast day is June 9. Around the same time that St. Patrick was taken to Ireland as a slave, Columcille (who was also known as Columba, Colum, Columbus, Combs, and Columkill), was born in Gartan, Co. Donegal. He came from a race of kings who had ruled in Ireland for six centuries and was himself in close succession to the throne. At an early age, he was given in fosterage to a priest. After studying at Moville under Saint Finnian and then at Clonard with another Saint Finnian, he surrendered his princely claims, became a monk at Glasnevin under Mobhi, and was ordained. He spent the next 15 years preaching and teaching in Ireland. As was the custom in those days, he combined study and prayer with manual labor. By his own natural gifts as well as by the good fortune of his birth, he soon gained ascendancy as a monk of unusual distinction. By the time he was 25, he had founded no less than 27 Irish monasteries, including those at Derry, Durrow and Kells. Columcille was also a poet who had learned Irish history and poetry from a bard named Gemman. In addition, he loved fine books and manuscripts. One of the famous books associated with Columcille is the Psaltair, which was traditionally the Battle Book of the O'Donnells, his kinsmen, who carried it into battle. The Psaltair is the basis for one of the most famous legends of Saint Columcille. It is said that on one occasion, so anxious was Columcille to have a copy of the Psalter that he shut himself up for a whole night in the church that contained it, transcribing it laboriously by hand. He was discovered by a monk who watched him through the keyhole and reported it to his superior, Finnian of Moville. The Scriptures were so scarce in those days that the abbot claimed the copy, refusing to allow it to leave the monastery. Columcille refused to surrender it, until he was obliged to do so, under protest, on the abbot's appeal to the High King Diarmaid. A very sad period in Columcille's life followed. Because he had protected a refugee and denounced an injustice by King Diarmaid, war broke out between the clans of Ireland. Filled with remorse on account of those who had been slain in the battle of Cooldrevne and condemned by many of his own friends, he experienced a profound conversion and an irresistible call to preach to the heathen. So, even though he loved Ireland with all of his heart, Columcille made the profound decision to become an exile. In 563, he and 12 companions crossed the Irish Sea in a coracle, which is similar to a curragh, and landed on a deserted island now known as Iona (Holy Island). It was here, on this tiny isle off the coast of Scotland, that he began his work. Eventually, Iona became the heart of Celtic Christianity and its existence was one of the strongest influences in the conversion of the Picts, Scots, and Northern English. From Iona, numerous other settlements were founded, and Columcille himself penetrated the wildest glens of Scotland and the farthest Outer Hebrides. He established the Caledonian Church and it is said that he anointed King Aidan of Argyll upon the famous stone of Scone, which is now in Westminster Abbey. The Pictish King Brude and his people were also converted by Columcille's many miracles, including driving away a water "monster" from the River Ness with the Sign of the Cross. Even though he was far away in Scotland, Columcille appears to have retained control over his monasteries in Ireland. In 580, he returned to his native land to take part in the assembly of Druim-Cetta in Ulster, where he mediated about the obligations of the Irish in Scotland to those in Ireland. It was decided that they should furnish a fleet, but not an army, for the Irish high-king. During the same assembly, Columcille, who was a bard himself, intervened to effectively swing the nation away from its declared intention of suppressing the Bardic Order. Columcille persuaded them that the whole future of Gaelic culture demanded that the scholarship of the bards be preserved. His prestige was such that his views prevailed and assured the presence of educated laity in Irish Christian society. Of the man himself and his personality, it is said that he was "well-formed, with a powerful frame; his skin was white, his face broad and fair and radiant, lit up with large, gray, luminous eyes..." Saint Adamnan, his biographer wrote of him: "He had the face of an angel; he was of an excellent nature, polished in speech, holy in deed, great in counsel... loving unto all." It is clear that Columcille's temperament changed dramatically during his life. Although his name means "dove", in his early years, he had a quick temper and was extremely stern with his monks; gradually, he softened and later in life, he was as gentle toward them as he had always been with children and animals. Columcille had great qualities, but ultimately, his chief virtue lay in the conquest of his own passionate nature and in the love and sympathy that flowed from his eager and radiant spirit. A poet and an artist who did illumination — perhaps some of those in the Book of Kells itself—his skill as a scribe can be seen in the Cathach of Columba (Columcille) at the Irish Academy (below) . 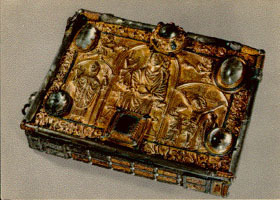 The oldest surviving example of Irish illumination, it was eventually enshrined in silver and bronze and venerated in churches. On June 8, 597, Columcille was copying out the psalms once again. At the verse, "They that love the Lord shall lack no good thing," he stopped, and said that his cousin, Saint Baithin must do the rest. Columcille died the next day at the foot of the altar. He was first buried at Iona, but 200 years later the Danes destroyed the monastery. His relics were taken to Dunkeld in 849. The year Columcille died was the same year in which Saint Gregory the Great sent Saint Augustine of Canterbury to convert England. Perhaps because the Roman party gained ascendancy at the Synod of Whitby, much of the credit that belongs to Saint Columcille and his followers for the conversion of Britain has been attributed to St. Augustine. It should not be forgotten that both saints played pivotal roles in spreading Christianity throughout the British Isles. In art, Saint Columcille is sometimes depicted with a basket of bread and an orb of the world in a ray of light. He might also be pictured with an old, white horse. He is venerated in Dunkeld, Ireland and also as the Apostle of Scotland. His feast day is June 9th, the day on which he died. Than if a host did round me stand." Article published in English on: 7-8-2009.